This Saturday, April 10th, I've booked a house show that's shaping up to be some pretty sweet times. To help promote the bands I've put together a playlist featuring some of their songs. Listen up! Bonus! We're offering a free download of all of these songs until the day of the show. Get it now, because after this Saturday they will no longer be available. Want more? Follow these links for more music and info. Plus, come out to the show to see it all live, up close, and in person. Andy Shauf and Chris Staples were booked in partnership with P is for Panda. Big thanks to Chad for all his help and work! 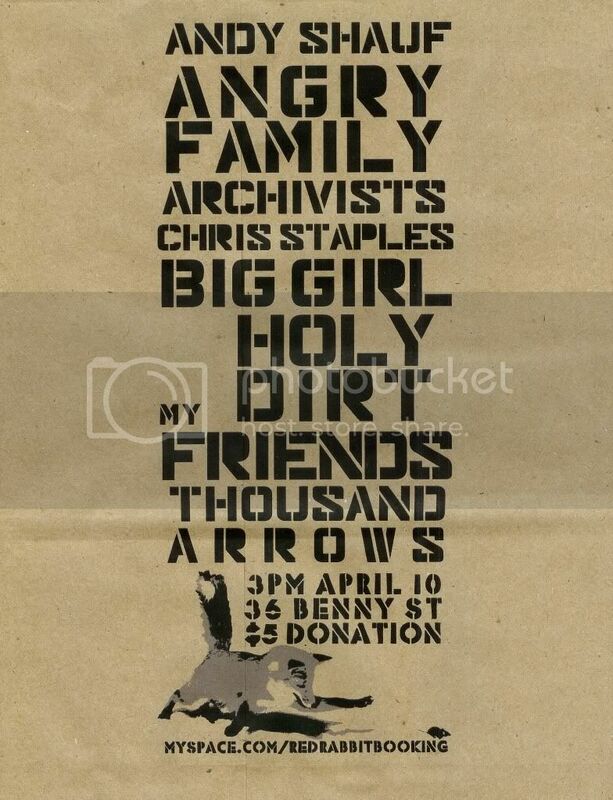 Note: All songs on the 4.10.2010 House Show Playlist are generously provided by the artists with their permission for the purposes of promoting the house show. Please use respectfully.